It’s the most wonderful time of year, and being in Disney World during this time is extra special. The Christmas decorations are fun to see and on select dates guests can attend Mickey’s Very Merry Christmas Party at Magic Kingdom park. Those that will be in Disney during the holiday season can now purchase tickets to this fun holiday party. The Christmas party is a separate ticketed event, but guests can enter Magic Kingdom at 4 p.m. with a party ticket. The official start time of the party is 7 p.m. and it runs until midnight. During the party there is plenty to do, so it’s good if you can enter the park as close to 4 p.m. as possible, if you don’t have a regular theme park ticket. This way you’ll be in and ready to go as the crowd thins out. Admittance to the park as early as 4 p.m.
Special character meet & greets, such as Jack Skellington dressed as Sandy Claws and Santa Claus himself. Reduced wait times for rides, including popular ones like Seven Dwarfs Mine Train. Free cookies and drinks, like egg nog and hot cocoa. Club Tinsel – A fun dance party at Cosmic Ray’s Starlight Cafe. Treats themed specially for the Christmas party. The Fireworks Holiday Dessert Party at Tomorrowland Terrace and the same party with Plaza Garden Viewing is also available during the party, but advanced reservations are highly recommended. There are usually also special PhotoPass opportunities that are only available during the party, including festive Magic Shots. My friend and I attended the Christmas party last year and had a great time. We were able to ride all the rides we wanted to ride and then some. Plus, we came away from the party with a bunch of cookies, which was safely packed away and brought back for our husbands and kids. I definitely recommend having an idea of what you want to see and do while you are there, so you are going in with a plan. The time goes by pretty quickly during the parties and you want to do as much as you can while you are there. November: 8, 11, 12, 14, 15, 17, 19, 21 22, and 24. December 1, 3, 5, 6, 8, 10, 12, 13, 15, 17, 19, 20, and 22. To buy tickets for Mickey’s Very Merry Christmas Party you can visit Disney’s website or contact your vacation planner. 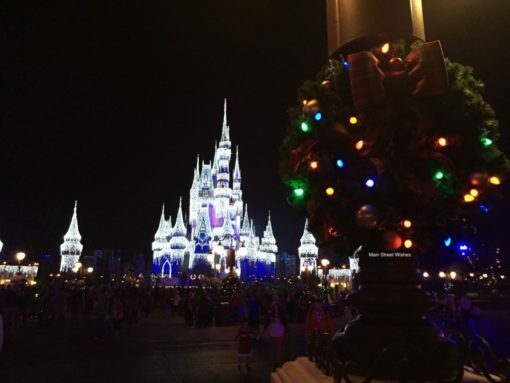 The Christmas party is a fun add on to a Disney World vacation!